So what is a hikesnob? It could be a person who believes a particular hike is far superior than other hikes or a person who needs to travel far and wide for a great adventure. We’re a bit of both! And we’d like to share with you all our adventures so you don’t have to research too much to find the information you’re looking for. We want to give you straightforward information for any destinations you may or may not want to visit. You’ll never know what hidden gems can be found in your area. So really, YOU’RE being the snob by deciding if a hike is worth your time or not ;P We like to give our own personal stories about the journey to these destinations because with HikeSnobs involved, there’s ALWAYS a story! Are those craysians riding the roof of that car moving at 75mph?! So what’s the crazy? The journey is the crazy! From breaking and entering to actually riding the roof of a car moving at 75mph 😉 We love doing things we’re not allowed to do and risking our precious lives (to an extent). As long as we don’t lose any limbs or suffer major injuries, we are down for it all! When we’re not being craysians, we’re just badasses exploring the world and all it has to offer. Linda’s an adrenaline-loving, adventure-obsessed, trouble-making mermaid (she wishes she was a mermaid). She’s always planning and ready for her next trip. If you’re lucky enough, you’d be invited to her trips and have your life changed. That’s what happened to Alice. Alice loves to travel just as much as Linda. Although she’s a bit more cautious, Linda’s motivation (instigation) allows her to overcome her fears so that she can be more of a badass than she already is. Alice’s witty humor always keeps everyone laughing. She is the perfect person you’d want on any trip! Both born and raised in San Francisco and having attended the same middle school, Alice and Linda didn’t officially start hanging out until they moved (at separate times) to Los Angeles in 2013. The very first week Alice came, Linda welcomed her with (what else?) a hike! Ever since then, they’ve been attacking hike after hike, trip after trip, adventure after adventure. Even though Linda moved back to San Francisco in 2015, both still try their best to continue their journeys and are always planning future trips together. 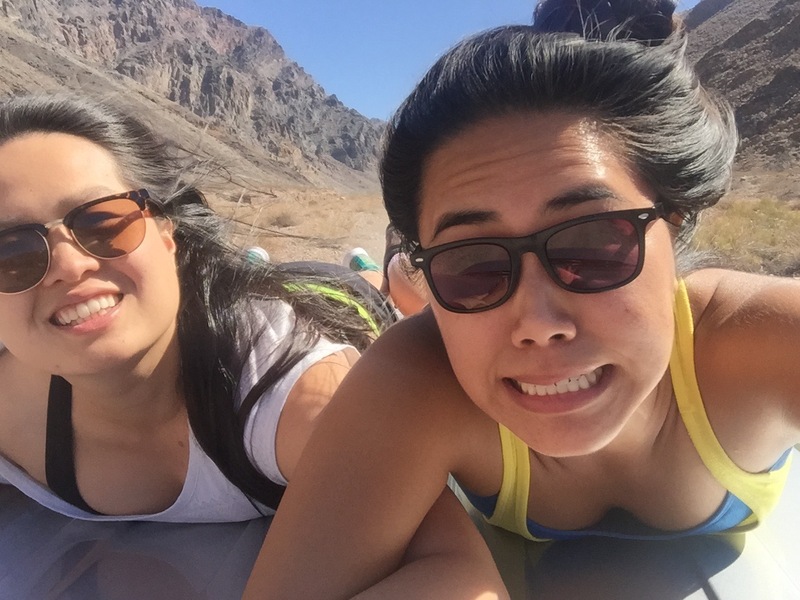 When Linda (@wander_often) and Alice (@alicehesf) travel together, it’s always a drama-free and fun-filled trip. They’re both easy-going, dependable and assertive women who will get the job done. Two independent women joining forces to create @HikeSnobs. Awesome blog and i love the car picture. I tried to do that but my mrs wouldn’t let me go faster than 10mph! Anyways, you need to get your butts to NZ- sooo many amazing hikes to do through the mountains and forests. Kent Manthie here…just wanted to say “thank you” for “liking” my review of the new Woods album. I hope you like it as much as I do! Too funny. I’m not Asian, but had my cray streak a couple decades ago! I’m still adventurous, but cautious rules my world! Keep on keeping on and have FUN in whatever you do! And pics to prove it! Not only riding on top of the car, but taking a selfie at the same time — you’re taking craysian to a whole new level! Keep it up. I love the hair whipping around with abandon in the top photo. That pretty much sums up how I approach life, too. Except with less hair and more coffee. This is a very fun and informative blog. I love the feature photo of the two of you running on the road. Your WordPress theme is really appealing. Thanks for visiting/liking my hiking/traveling adventures. Awesome introduction! Thanks for sharing your adventures and thanks for reading my posts about my hike in Anhui, China! I’m from Texas so that mountain was my first…and after that the rest of my trips in China had some hiking to it cause I knew returning back I’ll be stuck with just hills..and maybe a giant rock? I look forward to reading more of your posts! Yes, it’s great blog! What other part of China have you been to? We still have family over there! Oh wow! Yeah I loved the li river! I’ll be posting about that later soon. Still have a couple more Posts until I get to that one! Do you have any recommendations for a Full Moon hike in Nor Cal? April 22nd is setting up to be a good Friday night for this. Where in Northern California are you? I am in Manteca. That makes me right in the middle of the Sierras and coastal regions!!! We are not too familiar with that area. We only gone on a few hikes in Northern California outside of the Bay Area and have only been one 1 full moon hike. Hope you find a good one on the 22nd! Am just kinda starting out, & now drawing lots of inspiration from your blog !! Way to go girls !! Thank you! Best of luck to you! Very cool – thanks, I will be following you! Thanks for liking my post so I could how cool you both are! Hmu if you make it to Minneapolis! Thanks for the like on my blog, you two! If you love hiking and ever make it out to the Midwest, Duluth has some of the best hiking/places to explore. Being a California native, I never thought I could replace an ocean beach for a lake beach, but the North Shore has a lot of beautiful places to experience. Best of luck with your travels/blogging! Thanks for the tips Alexa! Love the shenanigans! A life filled with travel always needs a little adventure and hijinks! Some day I might share a story about the pirate statue in Dillon Beach…. What a unique travel blog that you 2 have set up. Interesting stories. Great blog! Thanks for liking my post “Welcome mate!” on my new blog called “myaussieadventure”. By the way, have you already been to Mount Rainier National Park in the state of Washington? There are great hikes there! Lol @ Craysian. What a fun blog. Thanks for liking mine. I enjoy hiking too, so whenever you are in Cape Town, South Africa, be sure to touch base so we can hike up Table Mountain together. Hey, thanks for liking my ‘Ford Mountain’ post! I am just starting out and your blog is a good inspiration. You guys should definitely cross the border into Vancouver, Canada, there are so many beautiful hikes to do. Great blog! I’ll have to try out some of the hikes! Let us know if you need some recommendations! Awesome blog! I love the format with all of the pictures! You both seem like you’re having a blast with life! Thank you Sarah! We appreciate it 🙂 Let us know if you need any recommendations! I think we have done that before. There is a rock labyrinth at the end right? There are a load of interesting hikes in Australia. I can recommend the Larapinta trail in Northern Territory and Freycinet in Tasmania! Awesome blog y’all have here! After being surrounded by concrete buildings for the past 11 yrs in NY and 7 months in Buenos Aires, I am dyyyyying to reconnect with nature. Will be moving back home to LA soon, so I’ll definitely be checking out some of the places on your site!! Awesome! We both lives in major cities too, nature is our escape. Let us know if you need suggestions for places to hike. lately I run across your blog and I found it inspiring to write a post on my own. Although I am not yet as passionate hiker, I like to to into the wild occasionally. I wanted to share my experience with you as I think it may be interesting for you as well. Also, come visit Slovakia, its nature is insanely pretty! Thank you so much, I’m glad we inspired you to write your own post! If you are ever in the States please come hike with us! If we ever make it out to Slovakia, we make sure to reach out! Great site. You are doing a fantastic thing and we enjoy. Thank you so much for your kind words. Let us know if you need any recommendations. I stumbled across your Instagram somehow (I’m @heretolinger) & perused your site a bit. Great info, super helpful! Love your pictures, too! What do you use for a camera? I’ll be in Los Angeles for the next few months and am always looking for new adventure buddies! Let me know if you’d ever wanna meet up sometime! I’ve been a fan of your blog since I moved to LA and needed some hiking recommendations. I just love you guys and thank you for all of your in-depth reviews on good spots. I feel like you guys are pretty real and I want to invite you to my new FB group for bloggers who don’t deal with all the fluff. I’ve recently discovered a love for Facebook Groups (even though I hate facebook itself) and I could not, for the life of me, find one that wasn’t completely fake. It seems like all of these groups are a ruse to get more traffic to the founder’s blogs and I just don’t want to hang out in a manipulative, spammy group. I want a group with like-minded bloggers who cut the fluff and aren’t obviously writing mostly for profit. However, monetizing your blog is important, SEO is important, design is important – all of that stuff is important. I’d rather discuss that stuff in all honesty without someone shoving their referral link for SiteGround down my throat. Anyway, you ladies are invited. I would be happy to have you in the group. It’s only bare bones right now because I’m inviting people like this, via email, since barely any of my real life friends blog. Feel free to decline! Feel free to ghost me! Hurt feelings about this don’t exist.